Born in London, Charles Altamont Doyle came from a family of caricaturists and illustrators. He was the youngest son of the artist John Doyle and brother to Richard Doyle. He was trained as an artist but following the advice of his father he moved to Edinburgh and took employment as an architectural draughtsman at the Office of Works. 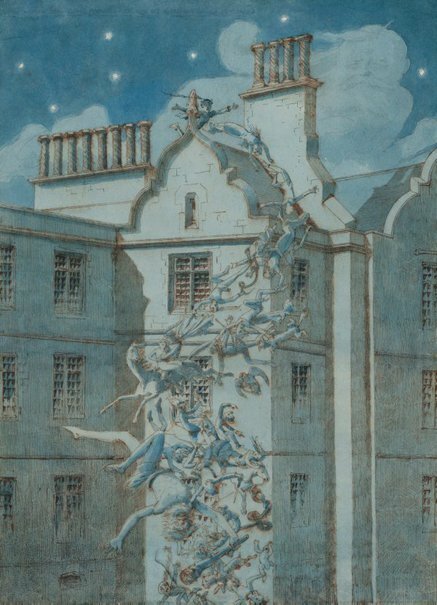 He held this position for over thirty years, during which time he exhibited several watercolours and pen and ink drawings at the Royal Scottish Academy depicting fantasy themes and fairies. His wit and sense of humour belied the struggles he had with his mental health. In 1885 he was admitted to the Montrose Royal Lunatic Asylum an alcoholic and epileptic, maintaining to his family that he was sane and had been wrongfully confined, but he died there eight years later on 10 October 1893. It appears that Doyle’s artistic work was a means of demonstrating to himself and others that he was sane. 'The spirits of the prisoners' is a phantasmagoric scene with fairies, imps and animals cascading over the rooftop of Montrose Asylum and down its dark, brooding walls. It reveals with such surreal clarity the painter’s disturbed or joyful visions of the spirit world, here surveyed by the bearded apparition in the clouds – a clearly identifiable portrait of the artist himself. Doyle’s fascination with the spirit and fairy world was inherited by his son, Sir Arthur Conan Doyle, the creator of Sherlock Holmes. Peter Raissis, Look , 'Hidden treasures revealed', Sydney, May 2017-Jun 2017, pp 42–48: p 46, col illus p 44. Victorian watercolours from the Art Gallery of New South Wales , Sydney, 2017, pp 18, 74–75, col illus pp 6, 75. Christie's New York, Old Master & Early British Drawings & Watercolors, 26 January 2012 , New York, 2012, p 98, no 136, col illus p 98. Lowell Libson, British paintings & works on paper , London, 2013, pp 122–25, col illus pp 122 (detail), 125.